Brandon Dees and I travelled to Austin, Texas, to compete in the Code for the Kingdom Hackathon, a Christian-ministry related event that was held at the Acton School of Business. We joined the super talented Charles Roach, the founder of Scriptive, a non-profit organization, to compete in the 48 hour startup/programming competition. Our mission was to code something that will impact the Kingdom for Christ through new technology. Brandon has agreed to help co-author this post so that you can read both his and my perspective on what it was like to be a developer at the hackathon. While Charles worked on the vision of how Scriptive would answer the question posed by the event, our job was to focus on programming the few high impact items that could be completed within a mere 48 hours. The work included Ruby on Rails, handwritten SQL, and a pile of raw bible-related data from multiple sources to somehow process. On early Friday morning, we both packed up our MacBook Pros and Unicomp buckling spring, mechanical keyboards (there is no point typing slowly on chiclet-switch laptop keyboards at a programming competition) and boarded separate flights to Austin, TX. In this photo, the developers for several teams are pictured hard at work in the main auditorium. Brandon and I are seated on the front row with our MacBooks and retro keyboards! Photo Credit: Terry Likens. 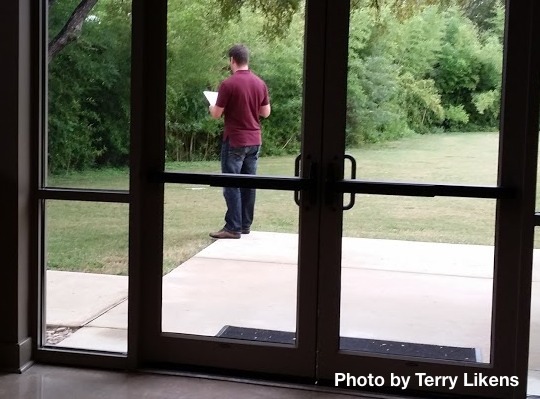 In this photo, Charles Roach is seen practicing the Scriptive pitch in the hour before the final presentations. Photo Credit: Terry Likens. After an intense development effort, Charles’ presentation, and an hour of waiting for the judges to decide between the 15 or so teams that presented, Scriptive was announced as the winner. 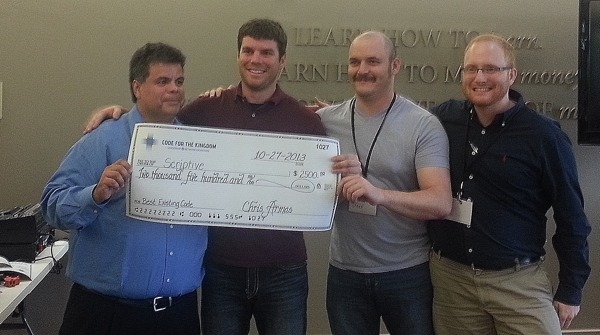 In this photo taken on Sunday, October 27, 2013, Chris Armas presents the Scriptive team with the best of existing code cash prize – from left to right Chris Armas, Charles Roach, Brandon Dees, and me (Frank Rietta). This was my first ever hackathon, so I wasn’t sure what I was getting into at first, but I had a great time and look forward to participating in more hackathon events in the future. Aside from the leap forward on scriptive.org development, it was fun and exciting to see the projects other teams worked on as well. DeedVine – The second-place existing-code team worked on their platform for creating crowd-sourced “challenges” to turn good deeds into movements, with quantifiable results. Recycle My Water – Team Heflin won the “people’s choice” prize with a family effort to prototype an atmospheric water generator that is 100% 3D-printed to enable inexpensive sustainable clean water supplies to be constructed around the world in places where rain is infrequent. It was great to see kids learning how to code, and the concept is fascinating on multiple levels! They were prototyping their designs using a 3D printer that itself was assembled from 3D printed parts. “Treasure Hunt” was a cool mobile app and toolkit designed to allow teachers and organizations to easily create story-driven geocaching games to teach kids life lessons by exposing them to scriptural concepts. They have tested and proven the “fun-factor” and the kinds of possibilities for a tool like this in a variety of contexts are really intriguing. A service to alert people with equipment and skills whenever they are needed to assist when nearby disasters or emergencies occur. An app that gives people information and communication channels to recognize signs of human trafficking and to report the cases to authorities and rescue groups. A system that maps individuals looking for a church community to churches in their area based on personality profiles. A service to better enable people to volunteer to serve their communities and congregations based on their skills and resources rather than in ways that waste their potential. I had a great time, met some great people, and learned a lot. I’m looking forward to participating in more hackathons in the future. In my case, this is not the first programming competition that I have competed in. They are always a lot of fun. Brandon has done a great job summarizing some of the work of the other teams, so I am going to focus on what makes the competition environment so much fun. For me, one of the best parts of competing in the hackathon is the environment where you get to meet interesting people who are working on a variety of projects in a short period of time. The event was catered by Whole Foods so the food was good and it was easy to strike up engaging conversations with other entrepreneurs and developers. What I really like about the Code for the Kingdom event is that it is based on a larger altruistic purpose. The challenge was the open question about “how can technology help alleviate and eradicate all forms of injustice in a child’s life, while teaching him or her about God’s unconditional love?” The vision is massive and there is no way a little bit of software can accomplish all of that. It is only something God himself can do, but we felt up to the challenge to do a small thing towards the goal. Our project was working on Scriptive, which is a website and soon an iPhone app that attempts to connect scripture to childrens’ everyday lives through the emotions that they feel. During the competition, we worked on key additions to the existing Scriptive bible verse recommendation technology. We worked first on the API that supports the upcoming iPhone app and more interestingly to me, a data mining project on open bible data that doubled the number of scripture recommendations in the search index. The weekend’s data mining project and working on the Scriptive algorithm has energized my personal interest in areas of machine learning algorithm research and applications. To that end, I have enrolled in an online Machine Learning class that is offered by Stanford University through Coursera and I am pursuing other books on this topic and reviewing statistics math. As a computer scientist and Christian, I consider myself blessed to work on the Scriptive search technology. Most bible resources are based upon keywords lookups (just a concordance in most cases). With Scriptive, I have had to push our PostgreSQL database to its limits to return relevant emotions and then recommendations based upon natural language queries. We have the opportunity to go much deeper through the meaning of words in context and the relationships between emotions and searches and then between emotions and relevant passages from the bible. It’s about helping real people at the place where they are on a personal level. It’s not everyday that one gets to build software that may have this level of impact. I had a great time and look forward to the next time! Brandon Dees and I both work as full time Ruby on Rails developers at Rietta Inc, which focuses on building web applications for seed-level and bootstrapping startups. You can read about our development services at Architectures for Web Applications at Atlanta Ruby Developer.